Dexter Daily: POLL: Which Was Your Favorite Ninth Episode of a Season? POLL: Which Was Your Favorite Ninth Episode of a Season? Vote now, for your favorite ninth episode of a Dexter season! Season 1 Episode 9: Dexter receives a registered letter that informs him that his biological father has recently died. This comes as a shock, because Harry, Dexter's adoptive father, had told Dexter that his real father had died over 30 years ago. As Dexter takes off to reconnect to his shadowy past, Rita decides to come along to help him make it through the weekend. Then Debra and Rudy join them for the weekend at the dead bio-dad's house and things become even more awkward. Back in Miami, Doakes is involved in the questionable shooting of a middle-aged Haitian man. Internal Affairs investigates and Batista has to decide if he's going to tell the truth about the shooting, or back Doakes' untrue version of the actual incident. Season 2 Episode 9: As Dexter tries to distance himself from Lila, he discovers she is not so willing to let go of their relationship. Meanwhile Lundy's manhunt for the Bay Harbor Butcher starts to make Dexter nervous as he tries to stay one step ahead. However, in the end it is Dexter's worst enemy who discovers his secret first. Season 3 Episode 9: Dexter starts to fear that Miguel may have strayed from the newly taught Code. This concern starts to put a strain on their friendship. And Dexter doesn't get a reprieve from this at Rita's either. Sylvia, noting how Miguel is never at home anymore, tells Rita that she is now convinced that Miguel is having an affair. Rita decides to confront Miguel about his indiscretions. Meanwhile, Anton is confirmed to have been taken by the Skinner, sending Debra into a furious search, not only for Anton, but also for his potential killer. Season 4 Episode 9: Dexter stops by Arthur's house for a visit and realizes that though Arthur is in appearance the happy family man, he is in fact terrorizing his family. According to Arthur's son Jonah, they are all regularly beaten. Jonah is afraid to confront his father and invites Dexter for Thanksgiving dinner. 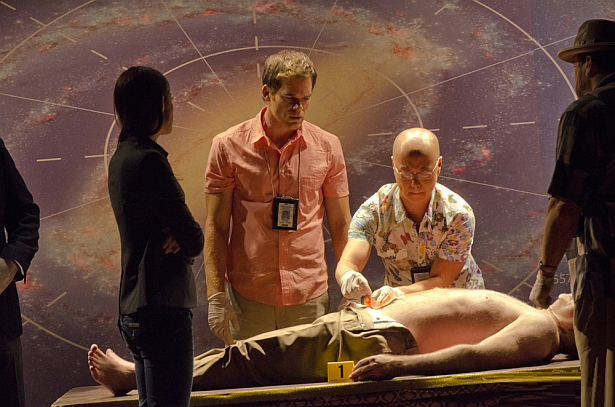 The confrontation between Arthur and his family forces Dexter to take action. While Dexter is away for lunch with the Mitchells, neighbor Elliot kisses Rita and she clearly lets him, though she immediately regrets it. Meanwhile, LaGuerta and Batista finally admit to what has been obvious for some time. Elsewhere, Joey Quinn spends the holiday with his reporter girlfriend Christine Hill, but he clearly has commitment issues and is starting to feel hemmed in. After he leaves, she gets a surprise visit from her father. Season 5 Episode 9: Dexter's life is turned upside down however with the sudden arrival of his step-daughter Astor and her friend Olivia. They're drunk and have lied about where they are. Astor is rebellious, refusing to tell Dexter what she is up to or why she is acting this way. She is also convinced that Lumen is Dexter's new girlfriend. When the girls disappear from his house, he fears that Chase is on to them and the girls have been kidnapped. Dexter is forced to reveal to his colleagues that he's been seeing Chase and they also learn about Lumen, who Dexter describes as his new tenant. At the station meanwhile, Debra has been assigned to work in the filing room and comes across some startling information about the barrel girl murders. She also learns about Quinn's suspicions of her brother. Season 6 Episode 9: Dexter receives help from an unexpected source while hunting the Doomsday Killers and staying one step ahead of Homicide; Debra discovers something new about herself in therapy. Season 7 Episode 9: Dexter, preoccupied with Isaak, gains an advantage thanks to an internal struggle within the Koshka brotherhood. Meanwhile, Miami Metro is on the hunt for an arsonist and Dexter goes to great lengths to protect his relationship with Hannah. Season 8 Episode 9: Dexter investigates a murder that hits close to home. Dr. Vogel gets the surprise of a lifetime when someone returns from her past. Which was your favorite ninth episode of a season?